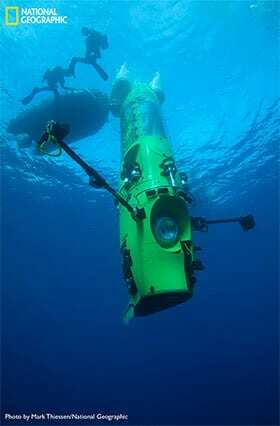 The human-occupied vehicle (HOV) DEEPSEA CHALLENGERis a one-person submersible capable of reaching full-ocean depth. It was built in Sydney, Australia, by Acheron Project Pty., Ltd., and piloted by James Cameron to Challenger Deep, the deepest spot in the global ocean, on March 26, 2012. In March 2013, Cameron transferred the DEEPSEA CHALLENGERto WHOI, forming a partnership to stimulate advances in ocean science and exploration and to build on the remarkable technological breakthroughs embodied in the vehicle. The DEEPSEA CHALLENGERincorporates many new technological advances that will likely help advance underwater exploration for years to come. Among these is its unique vertical orientation in the water, innovative materials such as the highly sophisticated syntactic foam, and a high-quality video imaging system capable of producing 3-D movies of the seafloor. The 24-foot (7.3-meter) vehicle has three main sections. The biggest section, the "beam," is made of a new kind of syntactic foam, the only flotation material capable of withstanding the crushing pressures of the deep ocean. Roughly 70 percent of the vehicle's volume is made up of this foam, which is composed of glass spheres embedded in an epoxy resin and which provides both flotation and structural support for the vehicle. Incorporating stronger foam opens the door to making more effective use of the material as a structural element and will help make vehicle designs more efficient. A personnel sphere is slung below the beam; below that is an array of cameras, samplers, and other scientific gear that the pilot can deploy to carry out scientific surveys and collection while on the seafloor. Its unique vertical design enables the DEEPSEA CHALLENGERto descend and ascend rapidly through the water, maximizing time on the bottom and enabling the sub to be recalled quickly if weather on the surface worsens suddenly. The steel personnel sphere is 2.5 inches (6.4 centimeters) thick and 43 inches (109 centimeters) in diameter. It was designed to withstand the crushing pressure of the deep and was tested to an equivalent full-ocean-depth pressure of 16,500 pounds per square inch (1,138 bars); strain gauges attached to the sphere during testing indicated that the sphere could withstand up to 140 percent of the test pressure. The sub has two booms—long metal poles attached to the sides of the vehicle that the pilot can deploy hydraulically from inside the sphere. One holds a powerful spotlight, and the other a pair of HD cameras. More light is provided by a seven-foot (two-meter) panel of LED lights mounted on the front of the sub above the personnel sphere that can illuminate up to 100 feet (30 meters) through clear water. These high-ouput lighting systems and non-traditional cameras will provide new views of the deep ocean and help bring a broader appreciation for some of the least-understood parts of the planet. The vehicle runs on power provided by a bank of 70 lithium-ion (Li-ion) battery packs, each the size of a loaf of bread. There are three main buses of batteries—the sub can lose two and still function. Each battery is housed within a plastic case immersed in a bath of silicon oil and equalized to the pressure outside the sub through plastic bladders, enabling the electronics to be exposed to high water pressure without coming in direct contact with seawater. This avoids having to build heavy, pressure-resistant housings to keep the batteries dry and resulted the largest fully pressure-tolerant Li-ion batteries available for deep-ocean exploration. Beneath the pilot sphere is a payload bay that can be equipped to gather samples and capture images on the ocean floor. The pilot has a number of research tools available, including a slurp gun—a suction sampler that operates like an underwater vacuum cleaner to collect small, soft-bodied animals. A hydraulic manipulator arm controlled with a joystick from the personnel sphere allows the pilot to collect larger or more durable samples and deposit them in a collection basket or a biobox—a thick plastic box with a close-fitting lid designed to keep samples cool—mounted on the front of the sub. The manipulator arm can also deploy a push-core sampler, a device used to collect samples of seafloor sediment. The pilot has available six cameras to record inside and outside the sub during a dive. The largest is a Red Epic, which captures IMAX-quality, "5K-raw" images and is mounted directly in front of the small viewport on the sphere’s hatch. Other, smaller HD cameras were designed specially for DEEPSEA CHALLENGERfrom the sensor up and housed in proprietary titanium housings smaller than a soda can. Two of these sit on the end of the 6.6-foot (2 meter) camera boom to capture 3-D footage of the seafloor. Another two are positioned side-by-side on the wrist of the manipulator arm—one with a wide-angle lens and the other a macro lens for imaging small animals up close. Inside the sphere are two smaller HD cameras that together capture 3-D video of the pilot. The Oceanographic’s partnership with Jim Cameron propels a scientific and technical conquest to understand the ocean. Learn how you can be a partner, too. On March 26, 2012, National Geographic Explorer James Cameron made a record-breaking solo dive in the submersible DEEPSEA CHALLENGERto the Earth's deepest point.